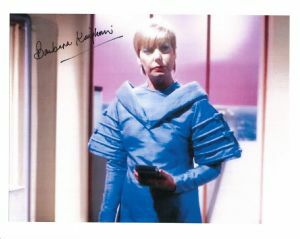 Barbara Kinghorn is a British actress who was a member of the Royal Shakespeare company from 1980 - 1983 playing Lady Capulet in Romeo and Juliet and Helen of Troy in Troilus and Cressida. She also played Timmin in the Doctor Who episode The Caves of Androzani. She appeared in Sorry! and Chance in a Million. Her West End appearances included "Fringe Benefits" at the Whitehall Theatre and "Good" at the Aldwych. In 1995 Black Swan published her autobiography entitled "Miss McKirday's Daughters will now Dance the Highland Fling" which received excellent notices and it was also printed by St. Martin's Press New York. Soon after she retired from the theatre and now lives in Spain.